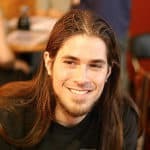 What’s the Best Homebrew Sanitizer & Cleaner? As a homebrewer, you will have to spend considerable time, money, and effort in cleaning and sanitizing your equipment. After all, you want your brew to be as pure and fresh-tasting as possible, don’t you? Although your typical household cleaning products might seem adequate for the job, there are many reasons why you should opt for brewing sanitizers and cleansers instead. Products specifically intended for cleaning brewing equipment won’t have perfumes that can affect the taste of your beer. They also don’t contain surfactants that leave filmy coatings in the interior of your system. The good news is that there are many options in finding the best sanitizers and cleansers that can clean your equipment more efficiently than any household product. Here, we review five of the most effective products available on the market. 1 What’s the Difference Between Cleaning and Sanitizing? What’s the Difference Between Cleaning and Sanitizing? Before we get into the different brands, it might be worth outlining the difference between cleaning and sanitizing. Although the terms are often used interchangeably, they actually refer to two distinct functions. Why is it so important to make the distinction? Cleaning out a brewing kit might get rid of the physical debris that accumulates in the interior, but it won’t get rid of contaminants that can cause off flavors or even illness. The best sanitizers will, but they aren’t nearly as effective in getting rid of debris. In order to get your brewing kit totally clean, you really need a good brewing sanitizer AND a good cleaning product. Five Star PBW cleaner is a buffered alkaline detergent that is a more effective cleaning solution than caustic soda cleaners. A unique blend of buffers and mild alkalis, it is especially effective at cleaning stainless steel, aluminum, and even plastic. It also won’t cause adverse skin reactions, so it is totally safe to use. PBW cleaner uses active oxygen that effectively penetrates carbon or protein soils, so it can be used effectively even with hard water. The oxygen also reduces BOD and COD in wastewater, making it a more environmentally-friendly cleaning solution than most other alternatives. In actual use, this beer bottle cleaner has proven to be a low-residue and clean rinsing solution that leaves no trace of odor. Brewing equipment comes out spotless, with no hard water marks left behind. For the money, you simply can’t find a better cleaning solution than Five Star PBW. 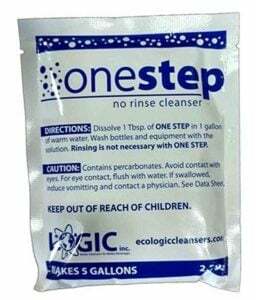 One Step No-Rinse Cleanser is an oxygen-based cleaning product that comes bundled with a number of starter brewing kits. Although originally marketed as a beer sanitizer, it has since been reclassified as a brewery cleaner due to its inability to secure FDA approval. 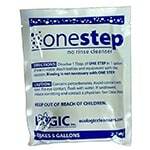 In any case, the One Step has proven to be a fairly effective beer bottle cleaner, certainly more so than most other products marketed as sanitizers. The solution is pretty strong, and does a good job of cleaning out most debris from brewing kits. 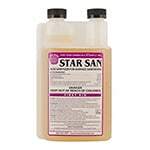 Star San is a no rinse sanitizer that is an effective response to home brewing sanitation needs. The solution foams up nicely which enables it to reach into the deepest cracks and crevices in your brewing equipment. With this beer sanitizer, you can be sure that all contaminants will be totally eliminated from your brewing system. 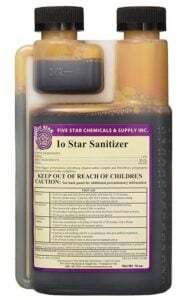 Star San Sanitizer is quite an economical brewing product. Mixed with distilled water, the resulting solution can be used many times over. The manufacturer recommends placing the solution into a squirt bottle so you can apply only as much as you need at any given time. As far as homebrew sanitizers go, you simply can’t do better than this product. Five Star IO is a low-foam iodophor sanitizer that doesn’t require rinsing afterward. The product is meant to be mixed with water at a ratio of one ounce of this product to five gallons of water (cold or lukewarm water may be used). However, this usually results in an overly-strong solution. The resulting solution gives you 25 ppm of titratable iodine. The manufacturer recommends two-minute contact for sanitation purposes. 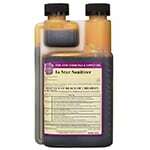 This iodophor sanitizer does not cause corrosion in steel or copper. 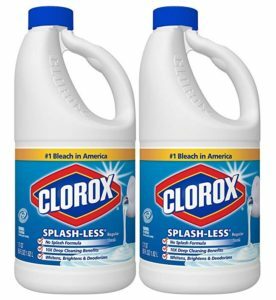 Clorox bleach is of course a familiar household cleaning product that is often used for kitchen and bathroom surfaces, fixtures, implements. 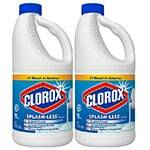 Bleach is so potent and economical that only a few drops in water are required in order to make a pretty strong sanitizer. Unfortunately, bleach isn’t really a feasible homebrew sanitizer solution. When used in brewing equipment, you will have to use a lot of water to flush out all the traces of bleach. This takes a lot of time and wastes a lot of water. Furthermore, contamination is still a possibility unless you use water that has been sterilized beforehand. And of course, there is also the risk of getting bleach on your clothes and fabric surfaces, causing unsightly spots. As far as cleaners and sanitizers for brewing solutions go, Five Star PBW is the clear winner. Strong and remarkably effective, it can clear out even the most stubborn debris when sanitizing brewing equipment. 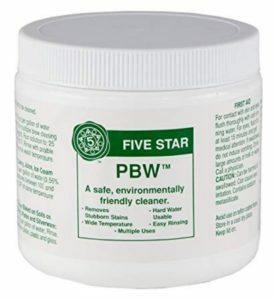 We also like the fact that the Five Star PBW cleaner is biodegradable. Furthermore, it won’t leave hard water marks on equipment, which is always a plus. If you have severe grime and yeast buildup in your brewing system and nothing seems to be able to get rid of it, definitely give it a try. 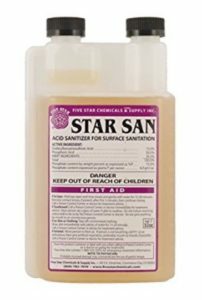 In the brewing sanitizer category, Star San takes the top slot by a wide margin. The foaming action might put some users off, but this is actually essential for getting the solution into cracks and crevices. Star San is also colorless and odorless, so you won’t have to worry about your beer taking on odd colors, smells, or flavors. As an added bonus, Star San can be reused several times. 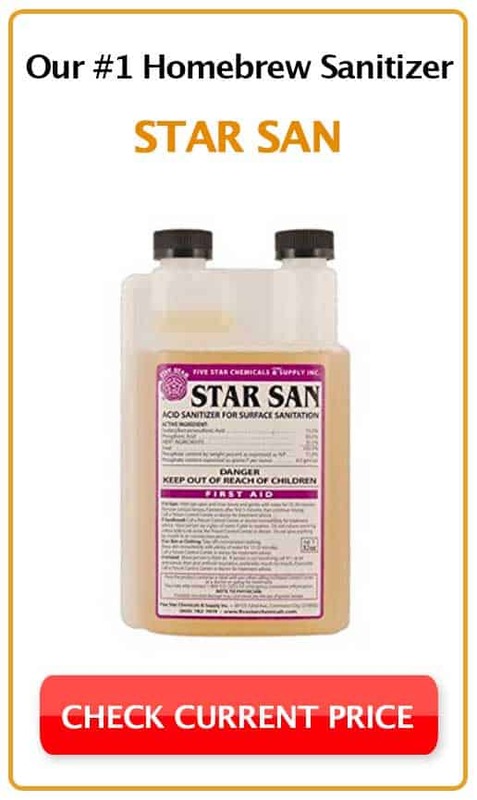 If an economical and convenient homebrew sanitizer solution is what you’re looking for, Star San should definitely be at the top of your list. Previous Post Yeti Rambler Bottle: Can This 64 oz Growler Keep Your Beer Fresh?